Ann Arbor, Michigan; 1925. Permission of Kelly Collins; all rights reserved. 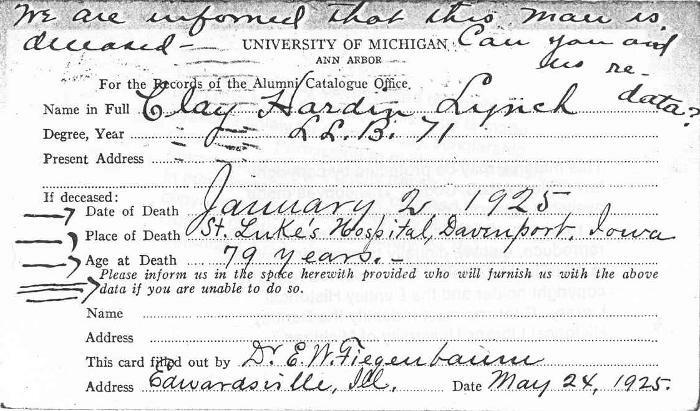 The Alumni Catalogue Office at the University of Michigan, upon learning of the death of Clay Hardin Lynch, sought assistance in updating their records. The office provided information on Mr. Lynch's degree and the year it was awarded. Dr. Edward William Fiegenbaum (1854-1927), brother to Clay's wife, Martha Lizette Fiegenbaum (1861-1923), also deceased, responded by providing the information the Alumni Catalogue Office was seeking. As his obituaries reveal, Clay's health towards the end of his life had not been good, and while visiting with his daughter, Mrs. Sophia (Lynch) Cook, of Moline, Illinois, he required hospitalization. After an extended stay of some months, he died early in the morning of 2 January 1925. His death certificate listed the cause of death as "carcinoma of prostate; metastasis to left hip and femur." It was a condition which had existed for one year. Dr. Fiegenbaum reported that Clay Lynch had died at the age of 79 years. However, existing documents reveal some uncertainty surrounding the exact date of his birth. The possibilities are listed in the description of his death certificate. Funeral services were held on Sunday, 4 January 1925, at the Edwardsville, Illinois home of Dr. E. W. Fiegenbaum. Clay Hardin Lynch was buried in Woodlawn Cemetery, in a family plot that also held the grave of his wife and one of their daughters, Julia B. Lynch.